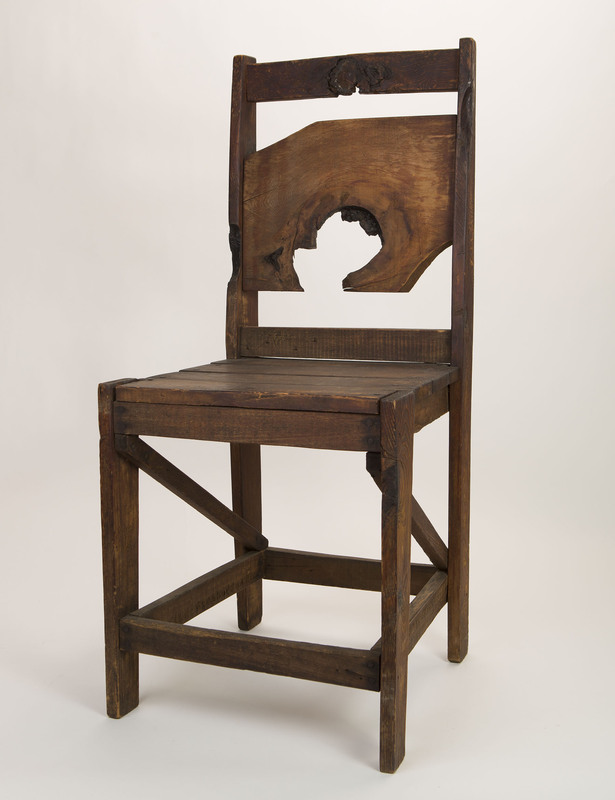 Chair constructed by Yorozu Homma while incarcerated at Heart Mountain concentration camp in Wyoming during World War II. Japanese American National Museum, Allen Hendershott Eaton Collection (2015.100.57). Check the Venues page to see where Contested Histories is traveling. Allen Hendershott Eaton’s historic 1952 book, Beauty Behind Barbed Wire: The Arts of the Japanese in Our War Relocation Camps, explored art and craft objects created by persons of Japanese descent while wrongfully incarcerated in the World War II American concentration camps. It was one of the first books to examine any aspect of the lives of the 120,000 inmates. In the course of conducting research for the book and a never-realized exhibition of camp artifacts, Eaton amassed a significant personal collection of such artifacts. After many years of lying forgotten in storage, the collection was inherited by a family friend of Eaton’s, who in April 2015 attempted to put it up for auction. An outcry arose from Japanese American community leaders and activists, who rallied successfully to stop the insensitive sale of these important artifacts of Japanese American history. Ultimately, the collection was transferred to the Japanese American National Museum for safekeeping. The display includes physical or digital representation of every item in the collection—more than 400 individual photographs, sculptures, paintings and watercolors, jewelry items, vases, beads, nameplates, and other items handmade by Japanese Americans while enduring incarceration in the WWII camps. In addition to providing the opportunity to see a collection that inspired strong emotions and decisive actions within the Japanese American community, Contested Histories is intended to help gather information about each individual object so that the museum’s efforts to preserve and catalog the collection can be as complete as possible. Camp survivors and their family members and friends will be encouraged to share with JANM information they know or remember about the objects, including who is depicted in the many photographs, most of which were shot by photographers working for the War Relocation Authority. A pop-up version of Contested Histories is now traveling to other locations in the United States for additional viewing and information gathering. Workshops will be presented in conjunction with the display at some locations. Please check the Venues page for confirmed locations and dates. Contested Histories: Art and Artifacts from the Allen Hendershott Eaton Collection was on display at the Japanese American National Museum January 7 – April 8, 2018. This project was funded, in part, by a grant from the U.S. Department of the Interior, National Park Service, Japanese American Confinement Sites Grant Program. Additional support was provided by George and Brad Takei, the Earle K. & Katherine F. (Muto) Moore Foundation, and Richard Sakai. The material in this pop-up display is based upon work assisted by a grant from the U.S. Department of the Interior, National Park Service, Japanese American Confinement Sites Grant Program. Any opinions, findings, and conclusions or recommendations expressed in this material are those of the author(s) and do not necessarily reflect the views of the U.S. Department of the Interior. Check the Venues page to see where the pop-up display is traveling. Interested in booking this display? Download the Contested Histories travel fact sheet or email Dina Furumoto at dfurumoto@janm.org for more information. View pre-conservation photography of the Allen Hendershott Eaton Collection on Flickr. Those with information about the origins of specific items are encouraged to share details. Top: Chair constructed by Yorozu Homma while incarcerated at Heart Mountain concentration camp in Wyoming during World War II. Japanese American National Museum, Allen Hendershott Eaton Collection (2015.100.57).